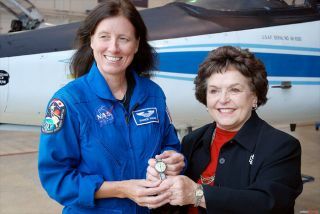 Astronaut Shannon Walker and Joan Kerwin, director of The Ninety-Nines, pose with Amelia Earhart's watch in October 2009. Walker flew the watch to the International Space Station. Thewatch that aviatrix Amelia Earhart wore while making history on twotrans-Atlantic flights was brought onboard the International Space Station(ISS) on Thursday, 82 years to the day after its historic first flight. Thetimepiece was among a few mementos — including a medal of honor — that flew toorbit with the outpost's three newest crewmembers. Earhart's watch arrived at the station onboard the RussianSoyuz TMA-19 spacecraft, which docked at the aft port of the Zvezda servicemodule at 5:21 p.m. CDT as the two vehicles were, coincidentally, flying overthe Atlantic. The hatches between the twospacecraft were then opened at 7:52 p.m., allowing NASA astronautShannon Walker, who was entrusted with the watch, and her fellow crewmatesU.S. astronaut Doug Wheelock and Russian cosmonaut Fyodor Yurchikhin to jointheir three counterparts onboard the ISS to form the six-person Expedition 24crew. Walker's own arrival on thestation made a bit of women's flight history of her own. Launched 47 yearsafter the first woman entered space and joining the station's crew one day shyof the 27th anniversary of the first U.S. woman in space, Walker — who is theworld's 55th female spaceflier — became part of the largest contingent of womenserving on a long duration mission with Tracy Caldwell Dyson. "Amelia crossed theAtlantic twice, once as a passenger and once as the pilot in command, flyingsolo, and she wore this watch both times," said Joan Kerwin, director ofThe Ninety-Nines, an international organization for women pilots. Earhart became the firstfemale trans-Atlantic passenger on June 17, 1928, departing Newfoundland andlanding in Wales in the United Kingdom almost 21 hours later. Her historic soloflight began May 20, 1932 and touched down 15 hours later in Northern Ireland. Before her disappearancein-flight on July 2, 1937, Earhart gifted the watch she wore on bothtrans-Atlantic trips to H. Gordon Selfridge Jr., who later gave it to FayGillis Wells, a charter member of The Ninety-Nines. Kerwin, who acquired thetimepiece from Wells at auction, presented it in October 2009 to Walker, amember of The Ninety-Nines, to fly to space. "Amelia is such an iconwith women in aviation and now with women in space. We are thrilled thatShannon is a Ninety-Nine and will be taking Amelia into space with her,"Kerwin said last year. Although the watch still runs,Walker won't use it to keep time but will keep it with her during the flight. "I am very honored totake this watch," Walker said after accepting it from Kerwin,"because to me it represents the continuation of women in aviation and thefield of aviation and how we continue to push boundaries and farther than everbefore." In addition to Earhart'swatch, Walker selected a few other mementos to bring to the station, whichrelate to her being the first native Houstonian to fly in space. Houston, Texashosts Johnson Space Center, where Mission Control and NASA's astronaut trainingfacilities are based. "[Houston has] a youthleadership council that works with the city and the mayor's office and I havethe key to the city that I'm taking up for them," Walker said in apre-flight interview with collectSPACE.com. For her alma mater, RiceUniversity in Houston, she has a plaque for their new space physics building. For the University of Houston,where her late father was a physics professor and was instrumental in startingup the College of Natural Sciences and Mathematics, Walker has "a littleposter." "[The poster] shows someof the history from when that college started and shows my father'spicture," she said. Walker is not the only newarrival onboard the ISS to bring small mementos with historical and personalsignificance. Her fellow American on SoyuzTMA-19, Doug Wheelock is set to become the first active duty U.S. Armyofficer to command a spacecraft — the space station. "The Army is really,really excited about this," Wheelock told collectSPACE.com. A graduate of the UnitedStates Military Academy at West Point, Wheelock packed his 1983 class crest anda small guidon, or pennant, for his Company G3. He also has Lester Stone'sCongressional Medal of Honor, awarded for actions in the Vietnam War. "He was killed in actionbut he is from my hometown area and as I was growing up, I participated in alot of activities at the American Legion there that was named for him. He'ssort of a hometown hero in that southern tier district of upstate NewYork," said Wheelock. Sergeant Stone's widowpresented the medal to Wheelock during a ceremony held in Harpursville, NewYork in April. "It ties together my Armyservice and a tribute to those who have gone before us and then also kind of atribute to my hometown as well," Wheelock said. For Soyuz TMA-19's commanderFyodor Yurchikhin it was important to bring photographs of his family,including his two daughters for whom he said he was flying some small items. Like Walker and Wheelock,Yurchikhin also packed some mementos for his schools, but it was a gift from ateacher that he packed for himself. "My dog, it is every timewith me ever since 1976, when I got it in high school. My teacher gave me andmy class members, he give us these dolls," said Yurchikhin of his stuffedtoy that he flew on his previous two flights as well. Yurchikhin and his dog, alongwith Walker and Wheelock will serve as part of the station's Expedition 24 crewuntil September when Dyson, Mikhail Kornienko and Alexander Skvortsov willdepart and Expedition 25 will begin. Three new crewmates ? Alexander Kaleri,Scott Kelly and Oleg Skripochka — will arrive soon after.